Mona Lisa was once "rosy and tender." What did the "Rosy Age" of our civilization's "masterpieces" actually look like? The ceiling of the Sistine Chapel at the Vatican was restored just before the turn of the millennium, which took Michelangelo's cracked, darkened work and returned some semblance of the original intent. One scene depicted by Michelangelo is the casting out of Adam and Eve from the Garden of Eden. Their taking of the fruit allows them to see the truth while separating them from their maker, much like art restoration opens our eyes to what a painting is supposed to be while taking away the original strokes of the creator. Since the Sistine Chapel ceiling has been restored, the light surrounding Adam and Eve has shined much more brightly -- illuminating more clearly than in decades both the beauty and the loss. Art restoration is a tricky game. Perhaps worthy to note is a quote often attributed to Leonardo da Vinci: "Art is never finished, only abandoned." Whether the original version of a piece or the deteriorated, surviving piece is the "true" artwork is all opinion. Though, many of our civilization's "masterpieces" don't appear as they were originally supposed to look. 1. The colors of "The Night Watch" should actually represent a "Day Watch" and multiple sides of the painting were cut. 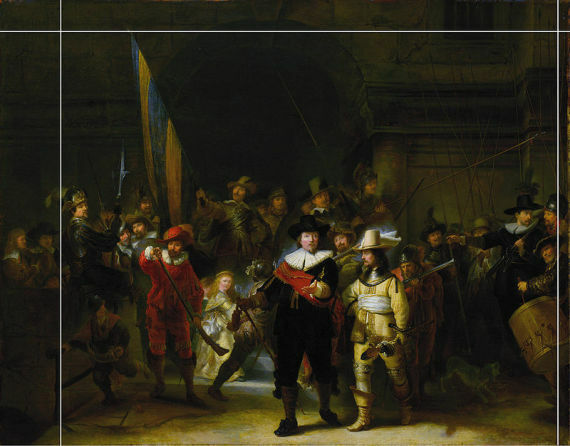 "Militia Company of District II under the Command of Captain Frans Banninck Cocq" was completed by Rembrandt van Rijn in 1642. The work was later called "The Night Watch," due to a decaying varnish that blackened the entire piece. After the varnish was removed, in the 1940s, it became clear that the painting was actually of a day watch, but the name had already stuck. Rembrandt had intended to use considerable darkness throughout the painting to highlight the bright colors of the militiamen's uniforms and the glow from the angel. Rembrandt's work was considerably cropped in 1715, when the painting was moved to the Amsterdam town hall, presumably because the space allotted to his work was too small to fit the painting. This sort of cropping was common during the period. Most notably, about two feet were lost from the left side, cutting out multiple members of the militia. An arch at the top was also cropped. The image is of a 17th century copy of Rembrandt's work that shows the lighter colors and what was removed in the crop. 2. The "Mona Lisa" is supposed to be far from brown and yellow and much of the ambiguity is just from deterioration. Leonardo da Vinci completed the "Mona Lisa" in the 16th century. The Louvre has housed the painting in Paris since 1797, but varnishes applied to the painting began to darken its look soon after the it was completed. Although the painting has been well-maintained -- it was immediately considered to be valuable -- the work has changed hands a number of times between the rich and the careful, even hanging in the bedroom of Napoleon Bonaparte. A quote from Giorgio Vasari, who viewed the "Mona Lisa" mere decades after its completion gives insight into how significantly the colors have been distorted over the years: "The eyes had that luster and watery sheen always seen in life ... the nostrils, rosy and tender, seemed to be alive ... The opening of the mouth seemed to be not colored but living flesh." The image at right is believed to have been painted by an apprentice of da Vinci at the same time he was working on his "Mona Lisa." It should be noted that these are probably not intended to be exact copies -- the smile and eyes are particularly different -- but the coloring gives decent insight into what da Vinci's work could have originally looked like. 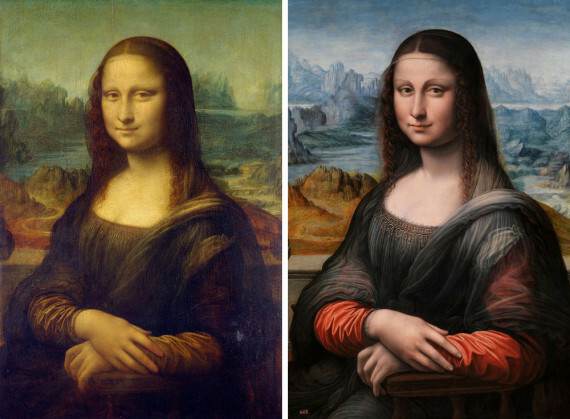 The Art Newspaper has a picture of a digital cleaning of da Vinci's "Mona Lisa" that also shows brighter colors while maintaining the signature face. 3. Many details from "The Last Supper" have been lost, including Jesus' feet and Judas spilling salt. "The Last Supper" was completed in the late 15th century, on a wall at the monastery of Santa Maria delle Grazie in Milan, Italy. The painting took Leonardo da Vinci a few years to complete, though the exact timeline is unknown. Legend has it that that da Vinci became enraged at a prior who expressed frustration with the number of years the painting had taken to complete, and so the painter threatened to use the prior's face as the model for Judas. Besides deterioration over time, several notable destructions to the piece have occurred. In 1652, a doorway was inserted into the mural which removed Jesus' feet. During World War II, the monastery was bombed, though, remarkably, the wall with "The Last Supper" remained intact. The bottom image is a copy of da Vinci's painting by Giovanni Pietro Rizzoli, completed in the early 16th century. It has been used as the primary source for 20th century restoration. 4. 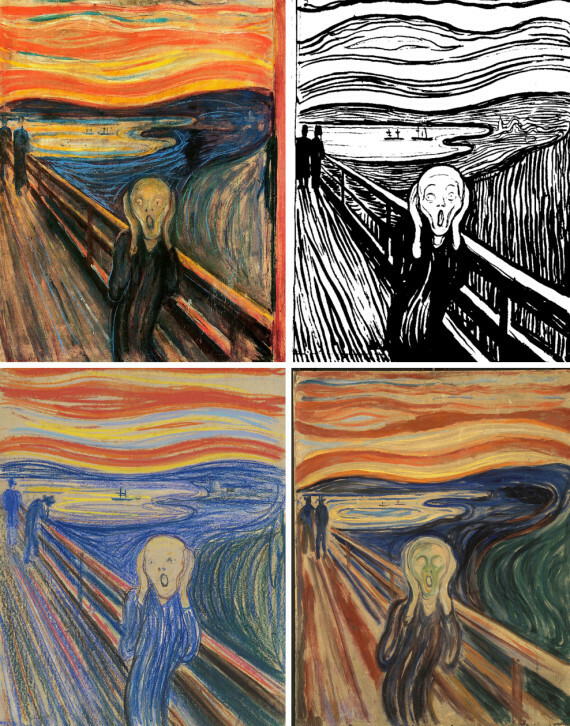 "The Scream" is actually four different works. Edvard Munch created "The Scream" series between 1893 and 1910. The medium for two of the works is paint, one is pastel and the other is a lithograph. (A few dozen lithographs exist.) In 2012, the pastel, a lesser-known version of the painting, broke a record at Sotheby's as the "world’s most expensive work of art ever to sell at auction," for $119.9 million. A departure from other works featured in this article, "The Scream," as the collective piece, hasn't been significantly altered over time -- it's barely been a century since the works were completed. The inclusion Munch's "'Mona Lisa' for our time" felt necessary as most people do not realize there are four separate works, each significantly different than the previous version. The image at top left is the painted original, top right is the lithograph; bottom left is the pastel and bottom right is the other painted version. 5. The yellows of Van Gogh have faded considerably. "Bedroom in Arles" has become particularly distorted. The first version of "Bedroom in Arles" was completed by Vincent Van Gogh in 1888, but he painted 3 in total. 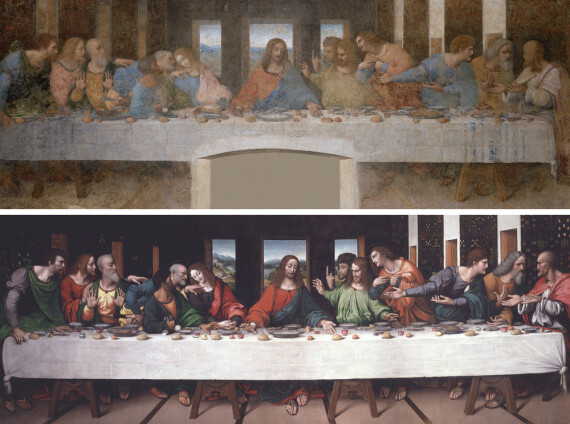 Each version has marked differences from the other, but since all three were made to be casual gifts at the time of completion, rather than works of intent by an "artist," the lesser-known second and third works are more like separate works rather than parts of a triptych. The yellow pigment Van Gogh used has browned with age, a problem that has plagued many of his other paintings as well. Van Gogh's signature yellow was made possible by the industrial revolution, which introduced new pigments including chrome yellow, a "toxic lead chromate and like many of the pigments of the period was chemically unstable." The image shows the restoration process by the Van Gogh Museum in Amsterdam. For a representation of what the museum thinks the colors would have actually looked like, visit its blog. 6. 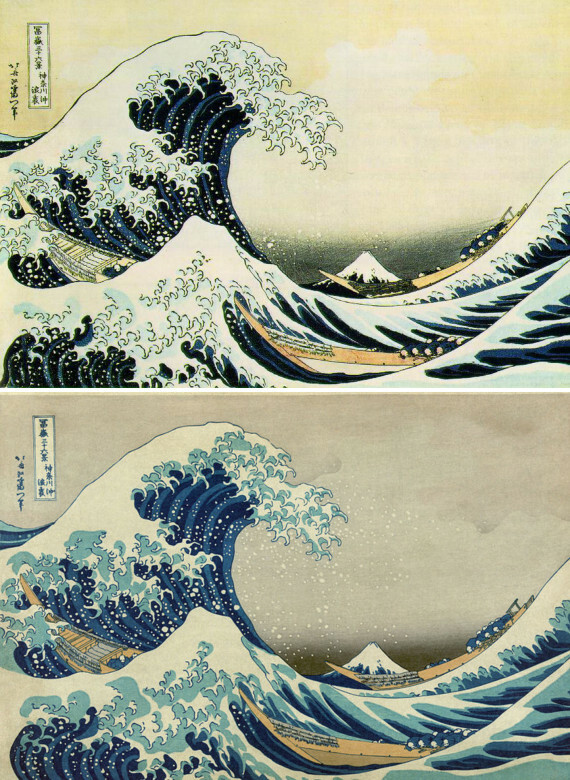 "The Great Wave off Kanagawa" is a series of woodblock copies, and the versions major museums display are distorted. Katsushika Hokusai completed a ukiyo-e woodblock print in the early 19th century. "The Great Wave" is part of the larger series, "Thirty-six Views of Mount Fuji," which includes 46 prints in total, after the initial prints became popular. Created with the malleable woodblock, thousands of copies were made, yet each is slightly different. Some have lost the originally intended details. So many variations of "The Great Wave" qualify if for inclusion in this article because it is difficult to say which is definitive. At the very least, details have certainly been lost from the original as the wave now looms before a sky of yellow in most versions. The top image is of the copy held by the Metropolitan Museum of Art in New York City; the bottom image is of a restored version. 7. 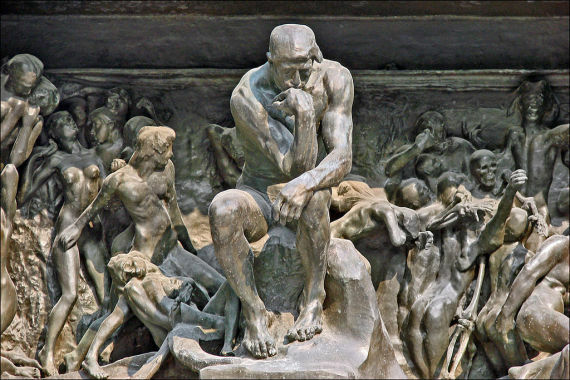 "The Thinker" was originally conceived as part of a piece based on Dante's "Inferno." It was also called "The Poet." Auguste Rodin worked on "The Poet" in the late 19th century as a singular figure in a larger piece, called "The Gates of Hell," that would surround a doorway. There were 180 separate figures in the doorway and, originally, the you can view just how "The Thinker" was originally intended to be much smaller in scale. Foundry workers apparently named the figure due to its similarity to a Michelangelo's "Il Penseroso," or "The Thinker." After careful consideration, Rodin decided to make "The Thinker" an independent work. It was cast as a much larger statue, with dozens of copies eventually made. The image shows a casting of "The Gates of Hell" at the Musée Rodin in Paris. 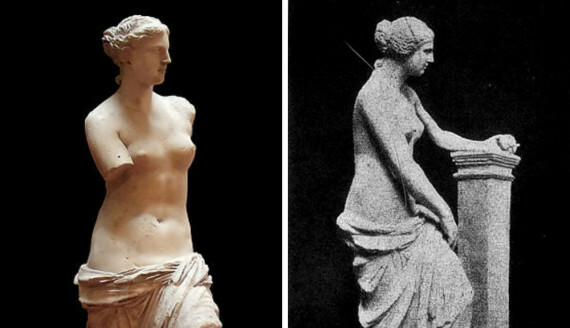 The statue was created circa 100 B.C., and, since it is of Greek origin, the depiction should probably be referenced to as Aphrodite, the goddess of love. The image at right is German archaeologist and art historian Adolf Furtwängler's restoration proposal, based on fragments of the arm found with the statue upon discovery. 1. She spent decades in a steamy bathing salon. The <a href="http://en.wikipedia.org/wiki/Francis_I_of_France" target="_hplink">French King Francis I,</a> who paid the equivalent of $10 million for the portrait, installed <em>Mona Lisa</em> at the <a href="http://en.wikipedia.org/wiki/Palace_of_Fontainebleau" target="_hplink">Palace of Fontainebleau</a> in a six-room “bathing” suite, where he and his guests soaked, smoked and sweated. Decades of high humidity took a toll on the painted lady. Attempting to repair the damage, a restorer applied a thick coat of lacquer, which fractured into a web of threadlike fissures. <em>Mona Lisa </em>has never since appeared without the veil.